It's been a busy semester, which may not actually make me special (no matter how much I think it does), but I'd like to take some time out to chart this fall's ups, downs and everything in between. I'm still rehearsing the MSM Jazz Ensemble, but I've also added to my load with a music appreciation class this semester. Instructing a class is a lot of work, even my little class! While I never thought I'd be on the other side of the grade book, I have found it to be an enjoyable experience. Teaching students how to comprehend music has been an exhausting challenge, one that I hope I've been successful at. The learning curve has been difficult, though. Preparing lectures, organizing materials for presentation, handouts & guidelines for assignments, grading those assignments takes a lot more time than expected. My big goal has been to offer solid, practical advice on understanding jazz music as an art form. The ability to communicate one's thoughts are critical, and I only hope that I've sharpened some students' skills when it comes to expressing their opinions more clearly. It's a lofty goal, I know. But one that I'm interested in seeing accomplished, if only marginally. Between the classroom and the rehearsal room, I'm constantly telling people that they need to be clear in their message. My days are filled with a longing forclarity. This is most certainly a metaphor for my life, I just haven't pinpointed exactly what yet. Too busy. And my favorite quote from another jazz history class: "Jazz is more profound when it doesn't help pay the bills." 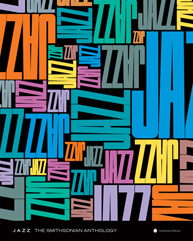 Speaking of jazz, history and jazz history...did you know that the Smithsonian Folkways label is releasing an updated collection of jazz recordings? It's about time, since their last update was nearly 30 years ago. With it, there is a revised track listing and several [drumroll] NEW recordings! There's a better representation of the last 60 years, especially, with a more diverse selection of cool, hard bop and avant-garde artists. It seems that they could have done a better job with newer material from the past 15 years, but I appreciate the inclusion of newer artists all the same. Maybe a completely new set featuring jazz music from 1970 and onward? Just a thought. As part of their marketing campaign for the new set, Smithsonian Folkways has posted a jazz history listening test for all 111 tracks. If you're on limited time (like me) you can also take the shortened 25-track test. I'm pleased to say that I named all 25 fairly easy: usually identifying the artist better than the song title. Michael Deal did a great job of compiling several strains of information (from song keys to lyrics to collaborations) on the Beatles, resulting in this fantastic page of graphic goodness. For a complete musical analysis of their output, I suggest reading The Beatles As Musicians: Revolver through the Anthology by Walter Everett. I'm loving the recording of "Love for Sale" by the Miles Davis Sextet on The '58 Sessions album. Especially noteworthy is Cannonball Adderley's solo. I need to transcribe this and use it in an arrangement for big band. I've never spent a lot of time listening to The '58 Sessions, but if my Listening to Jazz class has done anything for me on a personal level, it's been a joyful revisiting and rediscovering of jazz classics.